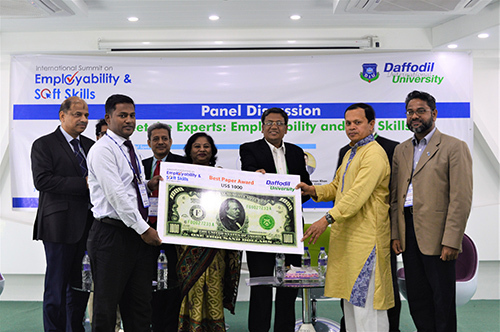 Mr. M A Mannan, MP, Honorable State Minister, Ministry of Finance and Planning addressing as the chief guest at the inaugural session of the three day ‘International Summit on Employability & Soft Skills’ began at Daffodil International University. Tree day ‘International Summit on Employability & Soft Skills’ ended at Daffodil International University from from 23-25 March 2017. To create a platform for the academics, researchers, employers and graduates for networking and discussing the skills gap agenda Daffodil International University in association with Uniuversiti Sains Islam Malaysia (USIM), Malaysia, and strategic partners organized this summit. Panel Discussants at the session on "Meet the Experts: Employability and Soft Skills"
The Objective of the Summit is to share research innovations and recent developments for improving employability and soft skills among the graduates and to provide an avenue for the training of trainers on innovative educational products and projects. The theme of the summit is “Developing Employability and Soft Skills among graduates. Addressing As the chief guest Honorable State Minister, Ministry of Finance and Planning Mr. M A Mannan, MP said Bangladesh has entered into the highway of development under the dynamic leadership of Prime Minister Sheikh Hasina. The country already has gained tremendous success in education, health, agriculture, economy, food and communication sectors and you are really lucky that you are proud part of all these development and change of the country. We would not see any speed breaker on this development highway, he added. To sustain this development he urged the students to achieve the employable soft skills during student life to face the challenges of global job market. Addressing as the Special guest Mr. Ranjit Singh Malhi said, A degree is only a way to entrance in interview board, nothing else. A degree can’t give you a job. You can get a job if you have enough soft skills. So, before complete your graduation you have to gain some soft skills like thinking skills, Communication skills and sense of responsibility. He also said, to get a job is not your credit but sustain in your job is your credits. Mr. Md. Sabur Khan said, Job seekers always blames that there is no job opportunity and employers said, we don’t find skilled person. So, we can see, there lays a gap between job seekers and employers. The purpose of this International summit is to find out this gap. Hope so, we will find out a way of employability and soft skills. Mr. Khan also said, Daffodil International University really wants to build up a skilled generation. That is why there is a course titled ‘360 degree’ is added for graduate level students to learn and gain soft skills required for employability. The three day summit includes research paper presentation, series of workshops and meets the expert’s sessions. 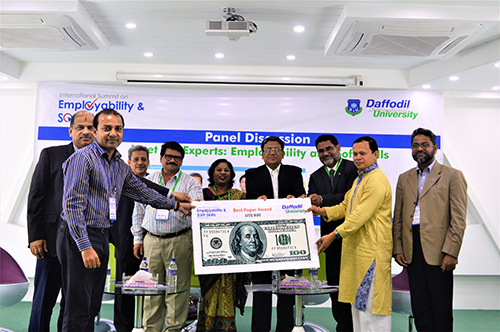 Peer reviewed and selected 27 research papers in three categories i.e., Employability in the Bangladesh Perspective, Employability in the Global Perspective and Academic Integrity of Employability Issues. Mr. Nicholas Mcdonalds, President, Australian Academy of Business Leaders (AABL) joined in the ‘Meet the Experts’ session through online. A total of 200 participants from 11 countries including India, Malaysia, China, Sri Lanka, Turkey, Nepal, Nigeria, Somalia, Djibouti and Bangladesh will participate in the summit. 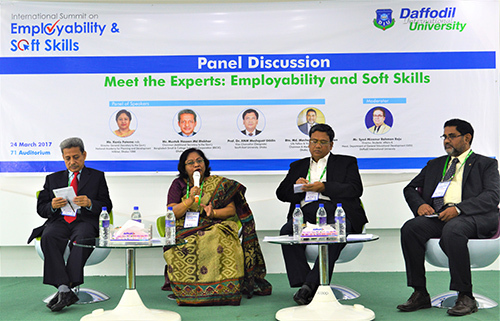 The Panel discussants of the Meet the Experts: Employability and Soft Skills were Ms. Kaniz Fatema ndc, Director General (Secretary to the Govt. ), National Academy for Planning and Development, Dhaka, Bangladesh, Mr. Mustak Hassan Md Iftekhar, Chairman (Additional Secretary to the Govt. ), Bangladesh Small & Cottage Industries Corporation (BSCIC), Dhaka, Bangladesh, Prof. Dr. ANM Meshquat Uddin, Vice-Chancellor, South East University, Dhaka, Bangladesh, Rtn. Md. Mashequr Rahman Khan, Vice-President, BSHRM, Chairman & Managing Director, PTDCA, Dhaka, Bangladesh , Prof. Dr. Syestranat Patnaik, Adviser to Founder, Kalinga University of Industrial Technology (KIIT) University, India . Meet the Experts: Employability and Soft Skills session were moderated by Mr. Syed Mizanur Rahman Raju, Director of Student Affairs. Mr. Md. Sabur Khan, Honorable Chairman, Board of Trustees, Daffodil International University was present as the chief guest at the Best Papers Award giving ceremony and handed over the award among the winners.